I Need Some Help Here! if the title doesn’t clue you in, let this review help. 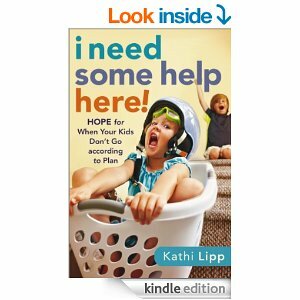 Kathi Lipp writes a great book about parenting beyond the typical, textbook situations. She writes about situations that occur in everyday real life. I think one of the best parts of this book is that she identifies the relationship between parent and child and doesn’t act as if the two are totally inseparable. She recognizes that children do have minds of their own and that as they grow, they make their own decisions sometimes despite all of the things they’ve been taught. She speaks to parents about their responsibilities as well as to the parent who is taking too much responsibility for their child’s decisions. With interesting and transparent stories from real life mothers, I Need Some Help Here! illustrates life happening. Sometimes the best help is just knowing you’re not alone. In this book Ms. Lipp talks about everything from temper tantrums to drug addiction. Each section ends with prayers specific to that topic. Ms. Lipp is an interesting and informative speaker and author. I Need Some Help Here! is a great book for parents of all ages.